Among the different kinds of wayang, one of the most popular is “wayang kulit” or shadow puppetry, a show that employs the use of light and shadows. It uses two-dimensional puppets usually made of buffalo hide and propped up on bamboo sticks. A lamp is placed behind the puppets so that their shadows are cast on a white cotton cloth, and the audience watches the show on the other side of the cloth. The story is narrated by a Dalang. To preserve and promote this old Javanese form of storytelling, which is still being practiced at present, Indonesian Ministry of Education and Culture inaugurated the Puppet Museum on August 13, 1975. When you visit the museum, you will be greeted at the entrance by two traditional puppets called ondel-ondel. The museum showcases a spectacular collection of over 5,000 puppets gathered from Java, Sumatra, Bali, Lombok, and Sunda in Indonesia and also from different parts of the world like England, France, Malaysia, India, Thailand, Vietnam, and the United States. Aside from puppets, the museum also displays wayang paintings and sculptures, as well as various materials and equipment used in shadow puppetry and other kinds of wayang, such as wayang suket, wayang golek, and wayang beber. Wayang suket is shadow puppetry that uses puppets made of grass. It is often employed in storytelling for children. Wayang golek involves the use of wooden rod puppets. Its origin is believed to have come from China. Wayang beber uses scrolls instead of puppets. The story is illustrated in a scroll, and a person narrates the story as the scroll is being unrolled before the audience. The ground where the museum now stands is where the old Dutch reformed church used to be before it was devastated by an earthquake in 1808. In 1912, a warehouse was built on the same place. The Dutch renovated the warehouse in 1938 to make it conform with their architectural taste, and this building now houses the Puppet Museum. The building has an area where seminars and trainings on shadow puppetry are held. The museum’s garden, which used to be the yard of the old church, still holds the remains of Jan Pieterszoon Coen, former Governor-General of the Dutch East Indies. The Puppet Museum is a worthwhile visit, as it gives you an insight and a taste of the old yet persistent practice of telling stories through puppetry shows. You can catch wayang kulit performances every Sunday at 10 am. 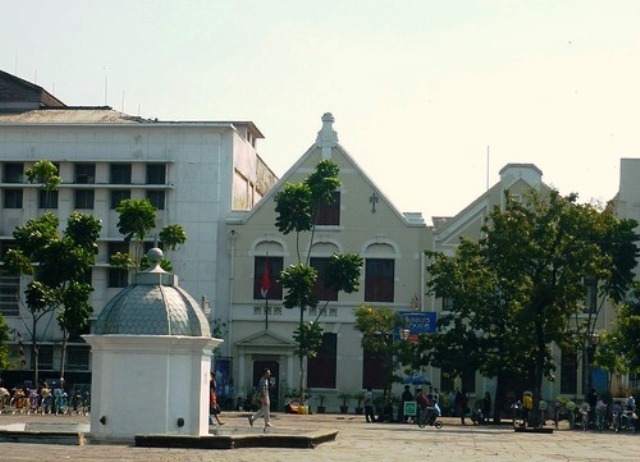 The museum is located at Jl Pintu Besar Utara No. 27, Jakarta Kota. It is open every day except Monday from 9 am to 3 pm. If you want to watch the shows, it is better if you call them first to confirm the schedule.